The Europe and Middle East (EME) blood gas and electrolyte analyzers market is highly consolidated and competitive with the leading three companies accounting for a combined share of over 65% in 2015, states Transparency Market Research (TMR). These top vendors are Siemens Healthcare GmbH, Radiometer, and Instrumentation Laboratories. Leading players are making substantial investments in research to develop high-performing portable devices in order to consolidate their market shares. Owing to a marked shift in demand from conventional table-top analyzers to handheld portable devices, the market is expected to witness spiraling investments in portable and multi-parameter patient monitoring devices, observes TMR. This will significantly alter the competitive dynamics of the market in the coming years. 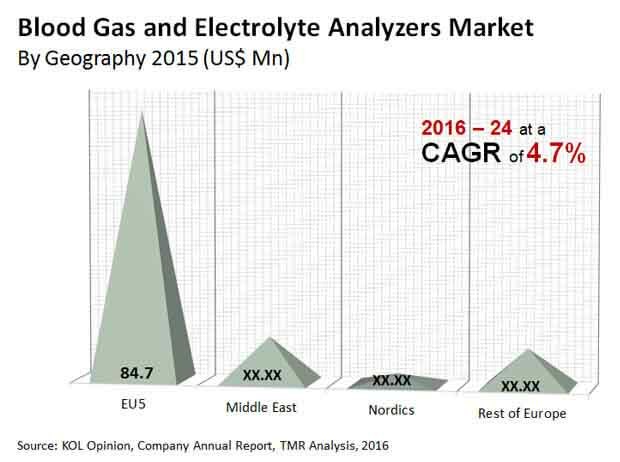 The Europe and Middle East market for blood gas and electrolyte analyzers is forecast to expand at a CAGR of 4.7% during 2016–2024. Estimated in terms of volume, the market is anticipated to register a higher CAGR of 5.0% during the same period. The market stood at US$114.4 mn in 2015 and is expected to surge to US$170.5 mn by the end of the forecast period. The three major geographic regions of the EME blood gas and electrolyte analyzers market are EU5, Nordics, and the Middle East; of these, the EU5 market accounted for the major share of 74.0% in 2015. In the forthcoming years, the regional market is anticipated to maintain its lead. The growth in the market is mainly attributed to a robust healthcare sector with an increasing focus on improving the quality of care in several countries in Europe. Based on modality, the EME blood gas and electrolyte analyzers market is segmented into laboratory, benchtop, and portable analyzers. Of these, portable blood gas and electrolyte analyzers will witness substantial demand among various end users in Europe and the Middle East due to their cost-effectiveness and easy transportability. The segment is anticipated to expand at a handsome CAGR of 5.0%, in terms of volume and revenue during the forecast period. The increasing prevalence of chronic diseases in Europe and the Middle East, coupled with a growing geriatric population, has spurred the demand for blood gas and electrolyte analyzers among patients in need for critical care. A swiftly expanding patient pool suffering from chronic diseases has led to a spike in diagnostic centers and hospitals in Europe and the Middle East, which is translating to numerous promising opportunities for vendors. Furthermore, constant technological advancements in analyzers have resulted in several innovations in blood gas and electrolyte analysis devices, thereby fuelling the market growth in several countries. In recent years, a substantial chunk of funds has been focused on developing reliable and high-throughput devices that significantly improve the diagnosis, thereby boosting the EME market for blood gas and electrolyte analyzers. However, the paucity of trained professionals and clinicians in several remote areas of EME and several measures by healthcare centers to reduce their overall cost are likely to hinder the demand for blood gas and electrolyte analyzers to some extent. Nevertheless, the launch of advanced devices that offer rapid test results—within a couple of minutes-and require low volume of blood sample is expected to unlock exciting opportunities for market players. In addition, the growing popularity of point-of-care diagnostics is expected to stimulate the demand for portable blood gas and electrolyte analyzers.